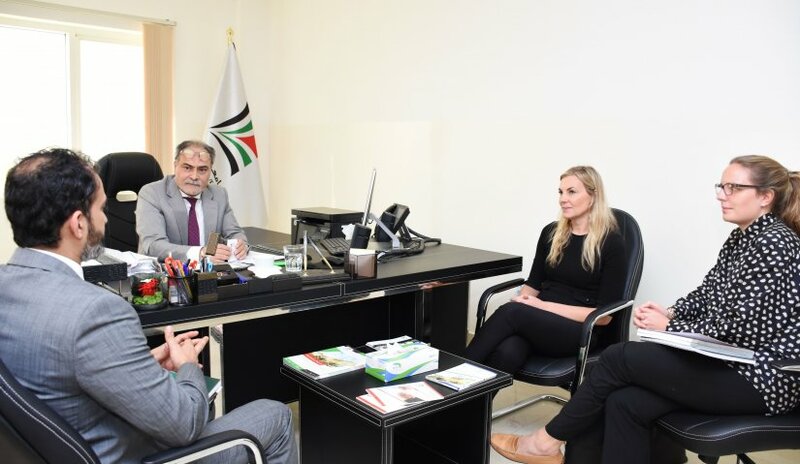 Prof. Abdelhafid Belarbi, Al Falah University President, received a delegation from INJAZ UAE, a nonprofit organization which specializes in volunteer-based programs catering to more than 10 million students from 121 countries in a year. AFU and INJAZ with the same goals to enhance innovation and creativity among students by providing training courses and to develop the professional skills required for the labor market, aim to develop a beneficial partnership to attain these goals. The visit comes in conjunction with the training course organized by AFU through the efforts of Deanship of Student Affairs scheduled for three days started yesterday, 8th April 2018 under the theme “Steer your Career”. Prof. Belarbi thanked INJAZ UAE for their efforts and keenness to provide students with the necessary skills to efficiently prepare for their future career. The training course covers several topics of interest such as leadership skills, emotional intelligence in the work environment and management skills.